Perhaps you were hunting around iTunes one day and came across a list of the top audio podcasts. There in the top five among the usual suspects from NPR was something called Stuff You Should Know. And once you started listening, you were hooked on the congenial chit-chat between hosts Josh Clark and Chuck Bryant, senior writers at HowStuffWorks.com (owned by Discovery Communications). And the topics, oh the topics, with one outdoing the next: How flamethrowers work, how you clean up an oil spill, and how hard is it to steal a work of art. 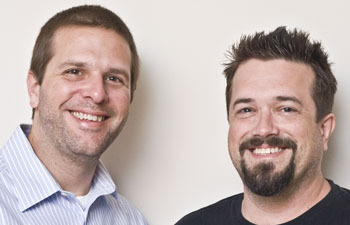 > The podcast was first started in April 2008 with Josh Clark as host with rotating co-hosts, with Chuck Bryant joining him to form the dynamic duo in August 2008. > They are not experts. Really, they’re not. > There’s a TV show in its second season on Discovery Channel based on HowStuffWorks.com, but Josh & Chuck aren’t involved with it. They would like to do something like that one day. > They have made more than 250 podcast episodes, and it has peaked at #1 on iTunes among all podcasts. > The shows take as long as they take. A show on cliff diving clocked in at 27:19 while a show on serial killers took 44:41. > In April 2010, the podcast had more than 3.5 million downloads. How do I know? Josh & Chuck’s PR person told me that. > Josh & Chuck still write for HowStuffWorks.com, and have become senior writers. They don’t have the time to start another podcast, but do have a blog and would love to take a live show around the country based on an upcoming audiobook. I had the pleasure of talking with Josh & Chuck recently in a wide-ranging phone chat, and the following is an edited version of that conversation. How did you get started with the podcast? Josh Clark: Yup, I did … HowStuffWorks is perfect for this kind of media and they wanted to expand the brand a bit [with a podcast]. I had no idea how to do it, and Chuck you didn’t know how to do it? Josh: And, frankly, to be honest I had never listened to an actual podcast before we started making one. Luckily we had a great producer and we were put together [as a team] and it worked out. We were surprised as anyone, probably moreso, that it’s worked as well as it has. Chuck: The great thing about it was that there was no pressure at all at the beginning. We were writers for the website and that wasn’t going anywhere, so if the podcast failed miserably they would have shut it down and we would have gone back to writing. We have a great company and a parent company Discovery Communications [that allowed us] to let it grow organically, by word of mouth, and it’s been a big success. 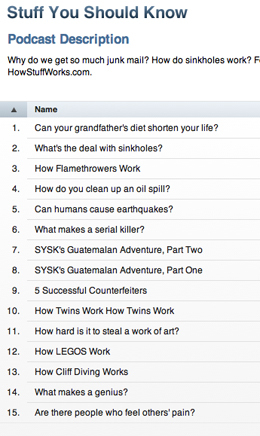 Josh: We found the only real pressure is when we are above Ira Glass in the iTunes ranking. Otherwise, we’re fine and feel like we can do whatever we want. Were you the first podcast produced for HowStuffWorks? Josh: We were the first one and it was a shot in the dark. It started to take off like a rocket. So they said, “Let’s get everyone on the content side doing podcasts.” We had our history podcast that started out as “Fact or Fiction” and I played the gullible rube who would say, “I heard this about this historical event. Is that true?” My co-host would say whether it’s fact or fiction, or would say — and this would rile people up — “that’s faction!” That went the way of the dinosaur pretty quickly and was replaced by “Stuff You Missed in History Class,” which evolved out of that and has been very successful. We have TechStuff, which is a great tech podcast. It has a great following, and the guys, Chris and Jonathan, are perfect foils for one another. They’re very subdued and rambunctious, respectively. We now have 10 total podcasts with a video podcast. Why do you think it became so popular? Chuck: The comment we get most from our fans on email or our Facebook fan page is: “It feels like I’m listening to a couple of my old friends from when I was in college, sitting around in a bar, having a drink.” The everyman quality that we both bring to the show really hits home. We’re not experts, we don’t profess to be experts. We mess things up every now and then, and people call us out and we read the correction on the air, and people get a kick out of that. It’s just a very down-to-earth smart discussion, usually pretty funny, and people get to learn something and have fun at the same time. Josh: The conversational tone that we manage to strike in every podcast is another compliment we get. “It’s easy to listen to” is something we hear a lot. The reason for that is we don’t practice together or rehearse. We both read the same article from HowStuffWorks.com, and we read it independently, do our own side research, ask our own questions and go over the topic and tear it apart and explain it bit by bit, including stuff we found in the article and elsewhere. We go off on tangents. We have a way of dating things by if it was before or after the first “Ghostbusters” movie came out. Every bit of this podcast has come about organically, was given room to grow on its own. That accounts for its success as well. So you base your subjects on a story that’s been written for the website, right? Josh: That’s right. That’s what gives it the structure. We both know the meat information that we both read over and over again to absorb it. That provides the loose structure, but within a topic … one of my favorite topics of all time is How Zombies Work. That was cut into two parts. One was movie zombies and surviving a zombie apocalypse. That was semi-fictitious. Then there was the true part about Haitian zombies and how they’re created. Knowing that’s how the article went, we knew when it was time to switch gears when we’d used up our external research. It’s very easy to tell, after doing this so many times, when we’re done. But at the same time, we’ve never been very pretentious about this. So we’ll say, “Do you have anything else?” And that stays in, it doesn’t get edited out. We’re not bashful about letting people see through the veneer of what we’re doing at any point. Though we do edit out any egregious mistakes — most of the time. You cover some pretty serious subjects but you have a light tone. Does that become difficult for you or upset the audience? Since that point in time, we’ve become a lot more confident that our approach could be applied to anything. So we’ve done “How Tourette’s Works” and we got compliments from people who have kids with Tourette’s. I think people identify with us on a personal level and they’re willing to forgive us. Chuck: We now cover ourselves a little upfront with a disclaimer of sorts. We did a show on serial killers and it turns out we’re not the only ones endlessly fascinated with serial killers. And we knew we would be joking around on the show, because that’s what we do, so we said, “We just want people to know that while we are fascinated with this and into this, we do know there are real victims and we don’t want to make light of that, so let’s get on with the show.” Every once in a while a little disclaimer goes a long way. Josh: Physics doesn’t really work in Chuck’s or my brain, it doesn’t fit that well. So we’ll research our little hearts out and try. We did a recent podcast on the Hadron Collider, but we did a disclaimer at the beginning of that one too, not that we would offend anyone, but that we would surely get several things wrong on this. And if you can correct us, please do. And we got corrections from astrophysicists. As recently as last Monday an astrophysicist came up to me and said, “You guys really screwed up the Large Hadron Collider.” But in a successive podcast, we read all the corrections on air, so the bad information we give out is corrected by someone who really knows what they’re talking about. How do you get your audience involved? They suggest topics and correct you, but is there any other way you interact with them? Chuck: I can’t say enough about our fan base. We’ve been lucky enough to meet some of them here on our trip to New York. We had a little get-together last night and are having another one tonight. They’re the kindest, smartest, most interesting, curious, inquisitive people we’ve ever met. Josh always says that they’re the largest collection of friends who have never met before. We get 350 fan mails a week, and our Facebook page has more than 10,000 fans after being up two months. We go onto Facebook a lot and we’re really active there, it doesn’t just sit there, and they appreciate that. It’s a big happy family. Josh: Plus, our Kiva team is another way people have got involved in a really tangible way. We did a podcast on how microfinance works, and how you can give loans to entrepreneurs in developing countries. We partnered with Kiva.org and set up a Stuff You Should Know team, and got to $100,000 donated within a couple months. [The total is now beyond $150,000.] There’s a subsection of fans that has taken over our team and are leading the charge to raise a quarter-million dollars to loan to entrepreneurs in developing countries by the end of August. Do you have plans to expand into other formats or do other projects? Chuck: We’ve done a few live speaking gigs and spoke at an education conference and that’s opened up a whole world to us, speaking in front of live humans, instead of just the two of us sitting in a room. Josh: If you want to be baptized by fire do your first speaking gig in front of a group of teachers and principals — especially if you were a smart aleck in school. They can tell 20 years on that you were somebody who would have given them trouble at their school. Do you think the reason you’re so popular is that typical journalism is not doing a good enough explaining the basics? Chuck: There’s some validity to that. Journalism and television media these days is pretty rapid-fire. You don’t get a lot of in-depth discussions on things. That’s why I love TV shows like “Charlie Rose” where you can get to the meat of the matter. We’re both big NPR fans; they do a good job of that. We’ve been able to expand the show, and when you have 45 minutes to discuss a topic, you can break it down, and it’s just a gold mine for guys like us. It used to be five minutes long and it became really hard to work in those constraints and so they just got longer and longer. What do you think about Stuff You Should Know? Why do you think it’s successful, and if you’re a fan, explain why in the comments. Thanks for profiling successful podcasters who are building on the basics of good talk/public radio.To many broadcasters the phrase, “you have a future in podcasting,” is paramount to the kiss of death. Yet, there are some truly talented hosts and producers out there who are breaking new ground, breaking formats, breaking records, showing us all the way. I would love to know more about how they built their audience. Is it all thanks to Facebook. I’m sure it doesn’t hurt that they are an off-shoot of an existing big media organization and powerful brand. Thanks for the comment. They only recently launched their Facebook page and their Twitter account is probably more recent as well. I think their growth was largely viral and word of mouth, with some help from the popular HowStuffWorks website. But as they said in the article, most of it was organic. Will check and see if it’s something else. I feel like podcasters like these are a terrible idea. Quality podcasting is either imparting information (by real experts), entertaining people or keeping an oral history of some sort. It really needs to serve one of those primary functions. I refer to the “Stuff you Should Know” podcats as “infotainment”. Take entertaining podcast hosts that talk about their personal lives and banter back and forth- oh and then try to insert a few factoids. It cheapens the information for them to not be better prepared and to use their personality (which are perfectly nice) to slide by. They should just do a podcast called ‘I pondered this today” and then just extemporaneously speak about any random thing and just be entertainers. Julie – I can confirm that both Facebook and Twitter came after the success. It was really a lot of word of mouth, I think. Our fans are pretty passionate about spreading the word. Also, iTunes was kind enough to feature us early on and we snuck into the top 10. It’s easier to stay in the top 10 than get into the top 10, if that makes sense. And finally, some of our shows were heavily promoted here and there thanks to the topic. For instance, our show about Muppets was promoted by the Henson Company – that always helps the cause! I am definitely a fan of Stuff You Should Know and have been for a while. I have to disagree with Chris. I do learn real things while I am listening. If Chuck and Josh just “talked about their personal life with a few factoids thrown in” then I don’t think it would be as popular as it is. Their podcast on the sun still has my mind spinning. I think it is successful not only because of the ease of the hosts, but because you DO learn something. I think as we grow into adulthood we appreciate education so much more. I can’t count the number of times people have told me they didn’t like history in school, but now they love to read biographies or they didn’t like science in school, but now they love science documentaries. We are curious creatures and love to learn about our world and this helps. I can’t speak for everyone on Julie’s question, but I heard about the podcast by word of mouth. Or word of blog actually. The actor Wil Wheaton wrote a blog post a few years ago listing his favorite podcasts and this was on his list. It sounded interesting and I have been a huge fan ever since. Imagine my surprise tonight as I log onto the PBS page and I see Josh and Chuck off to the right side! I love these guys! I feel like I am sitting with them during podcasts. As a classroom teacher, I listen to the podcasst during my planning or lunch break. My seventh grade students, who join me for lunch sometimes, are now fans, too! They have downloaded some of the podcasts on their own and we discuss the topics. Thanks for writing a great informative article on these guys, Mr. Glaser! I’ve been listening to Stuff You Should Know for about a year now, and its great! It really is a grassroots success. I heard about it through howstuffworks.com. Chuck and Josh are really awesome at explaining things in an easy to understand way.I cant say that I always want to know what they’re talking about, but they’re fun to listen to and always have great resources. It really is like listening to your friends at a bar explaining stuff… they just happen to be a bit more well read than my buds. I’m also impressed at the way they’ve been able to rally their troops into helping others thru Kiva and the Cooperative for Education (http://www.coeduc.org/guatemala/index.html). so does the kiva challenge mean we’re on Team ChuJo? JoChu? Not surprisingly, I also disagree with Chris Gholston. Information is finding us these days more so than us needing to go find it. Podcasts like this give us just enough information about topics that are happening out there that it either satiates our minimal desire to know about things we don’t really care about – flame throwers for instance – or inspire us to go on and learn more about something else – say, mirror neurons or epigenetics. Are Josh and Chuck going to fully inform anyone on a topic? No, but someone who truly wants knowledge will never get it from one source anywa and it is good to have exposure to things you may never have known you wanted to know more about. Stuff You Should Know is the first podcast I ever subscribed to. Many podcasts lose their appeal after a while, but this one remains interesting, funny, and cool. I love Josh and Chuck! So what if it’s “infotainment”. I’ve learnt something from almost every podcast and have been inspired by some of the podcasts to go on to do some of my own research when I’ve wanted more detail. And at the same time I’m always thoroughly entertained. This is top quality podcasting. Actually, they’ve only made 236 podcasts as of June 12th, 2010. Maybe they’ve recorded more, but those are the ones that have been released. I started listening to these two about a year or so ago and I am hooked. It’s reminiscent of The Daily Show but more factual and enertaining. You can’t tell me John Stewart hasn’t made politics something that our youth has started to pay attention to. No to gang up on Chris G. But these guys make learning about stuff you’d normally not be interested in listening to entertaining and that is on par with us listening to NPR, Planet Money, and other educational radio programming shows. When I listen to Chuck and Josh it’s like having a conversation with a smart frien that just found something interesting to share with me rather than a Phd. Professor educating me to sleep. I feel a more well rounded person because of this new breed of info podcasts. Thanks guys for making our Youth better because of your efforts. SYSK has been my favorite podcast from the start. Even when it was just 5 minutes long (although I enjoy the more in depth lenght now). As many have said it gives me enough information to either spark my interest to know more, or satisfy my desire to understand without being an expert. The great thing is I don’t just stop thinking about the subject when I am done listening to it. The show makes me think and grow and I have a really great time in the process. I’ll never get enough of this podcast and it will surely be a sad day when it (or Josh or Chuck) decide to move on. I started listening around the end of 2008, back when the episodes were about 15 minutes long. My favorite one was about things you can do with a dead body. Because of that episode, my mom wants to be turned into a synthetic diamond and I want to be shot from a cannon (purely for scientific research… yeah, that’s it). I have always been a casual podcast listener, with two types I search for; decent audio-dramas and random informative things. The friendly tone and willingness to show mistakes was what hooked me. Other informative talk radio formats simply put me to sleep. I love that the topics are sometimes on point with world news and other times are seemingly off-the-wall. The entertainment value is so high that I don’t ever skip an episode that has a “boring” topic. I know it won’t be, even if I have never been interested in it before. So thank you Josh and Chuckers for expanding my interests! I look forward to every new SYSK podcast, they are always without fail fun, entertaining and informative. Josh and Chuck may not get every fact right but lets face it even the experts make mistakes. I enjoy the fact that they routinely introduce me to new topics and things I wouldn’t otherwise be exposed to. Like the recent podcast on epigenetics. Fantastic listen guys. The beginning of the article could have described me. I started listening about 2 months ago because I had seen it while browsing the top 10 podcasts. What hooked me was they were fun to listen to and they reacted to the stuff they talked about. For instance when Chuck said he couldn’t look at the pictures of the birds and marine life of the oil spill. And Josh’s reaction to reading about US travel warnings to Guatemala (hilarious!). Another thing I like is that the fans are intelligent. Their comments are witty and/or thoughtful and often make me laugh more than the original wall post on Facebook. A great group all the way around. I am not being unfair, I have listened to SYSK and it is okay (wow…you guys really get into this? I guess “army” is a good way to describe their fans). My point is “How Stuff Works” is owned by Discovery channel and thus my expectations for the podcasts are higher considering who is paying their salary. I listen to tons of podcasts and the ones that I truly learn from come from people who are more reputable and inherently better equipped to explain the subject matter. They should just stick to topics like “how muppets work” rather than, for instance, try and explain the global financial meltdown. Read their staff bios and consider their use (or lack thereof) of primary sources. Again I am not discounting their podcasting talent, that are indeed entertaining. But that is what they should do, entertain. Or how Stuff Works should better be prepared and then, inform. My only concern is that in their attempts to do both they do neither well. To just “study history” doesn’t make you a historian and at any given time there are only a handful of references they use as source material. If I am looking for accurate information I would go to a number of history podcasts done by historians and learn something, follow that source material and learn more. Again, I think that as a personality the hosts are entertaining and engaging but certainly not a good informational source. I just expect more from Discovery Channel and How Stuff Works than what they’ve given me and thus I find SYSK to be of marginal use. Oh- and we could all support certain non-profits on our blogs and various social media platforms and lead campaigns. It is something we should all do. Moreover, we could all go the Guatemala and write about experiences… and for what it is worth, that was entertaining. In response to Chris Gholston, I have to disagree that “In their attempts to do both [entertain and inform] they do neither well.” In 2 months of listening to SYSK, I can think of at least eight times when I have learned something useful and immediately applicable to my life, and I’m not talking about “factoids”. For example, just the other day I correctly answered a question on a state licensing exam thanks to something I learned from SYSK. If the only people we ever learn from are experts then we are missing out on a wealth of information. My life would be far less rich without the everyday, non-academic learning experiences I have had. There is certainly room in education for different approaches and styles, and as Chuck and Josh don’t present themselves as experts, I find it unfair to call their podcasting “a terrible idea”. They present useful and accurate information, and on the occasions when it is inaccurate, they readily make corrections. Many thanks and keep up the good work, guys! I absolutely ADORE this podcast. Josh and Chuck have perfected the art of delivering high-brow knowledge to a mid-to-low-brow audience. I have learned so much from SYSK that I feel forever indebted to Josh and Chuck! While I respect Chris G.’s opinion, I think the idea of “infotainment” is being unfairly maligned. No one is saying that SYSK is their only source of reliable, exhaustive information on a particular subject. But if I feel like learning a little bit about a lot of different topics that don’t relate specifically to my fields of education or employment, then I don’t NEED an entire class in it or something. And then if a topic on an episode of SYSK winds up piquing my curiosity, certainly I’ll go read up on it from more in-depth research by experts in the field. The reason SYSK is so neat is that it gives you a condensed discussion of a topic that you either may have always been curious about or you may not have, but either way you’ll be informed AND entertained. And there’s absolutely nothing wrong with that. This podcast is highly entertaining mostly because it is accessible. The fact that it’s modest, genuinely curious, and hilarious doesn’t hurt. My friends and I listen to this podcast all the time at school. It was one of our teachers that got us hooked on it. I think that education is a highly versatile field, which is a good thing and a bad thing. It’s good because you’ve got the artistic liberty to pursue a bunch of novel ways to present information, and yet it’s bad because if you fail to move with the times, you will be left behind. SYSK is a prime example of how the pursuit of knowledge, when modern and done well, can reach a diverse range of individuals from all backgrounds, ages, and walks of life. My teacher turns this podcast on every Thursday in class. We listen, we learn, and we laugh. Josh and Chuck bring a very modest, almost unassuming approach to learning that is refreshing precisely because it is so low-key. They make it very clear every podcast that they’re not experts, and so I, as a listener, will say: “Hey! These 2 guys are just like me, and just as curious as me about how the world works. They’re not fancy experts with 8000 letters after their names.” You feel drawn to this podcast because the material covered is really, quite top-notch in terms of the pursuit of knowledge, and yet it’s very modest. That’s why I have SYSK on my iPod, and in my parents’ cars, and playing on speakers at my school. You guys are awesome! Not impressed. Stuff You Should Know is not very well researched, and doesn’t go into much depth. If you’ve spent any time reading common science literature then you’re likely to know most or all of what’s said on this show. But worse, they seem to get off on maligning famous scientists. They made a big deal of Carl Sagan being “a pothead,” and then they go on to judge him and his work based on that highly important information. One these two chuckleheads admitted that he’d never, ever watched a single Star Trek show or movie, says “I’m a Star Wars guy.” That’s just pathetic for science/science fiction podcast that covers many related topics. What a couple of morons. You’re missing the point of the show. The show is to get basic knowledge out to listeners in order to bring about a topic that was probably never heard of or in the dark and to bring it into the light. At that point, just like with anything else, if you want to know more about it, you go and learn more about it which is said at the end of every show. They have never claimed to be just a science/science fiction show. Their topics range from stuff they are comfortable with to things they are not, but regardless of their influences or specialties, they are still providing an entertaining service to listeners. The Carl Sagan episode did mention that he smoked pot, something Carl Sagan admitted to as well and yet these guys still showed a reverence to his work and saluted him. Carl Sagan was also a human and one born into a specific era defining time and so his influence from pot was definitely a part of him. Lighten up buddy!